IAmong the Aztecs and the Mayans, the monkey has been associated with dance, art, beauty and harmony. This specific day shows our life must reunite with art, that our ways of being, dressing, acting, must be each day more and more artistic, harmonious, beautiful, etc. Art is a means to instruct the emotional center, as we should not only instruct the mind; we should create a balance between science and art, between knowing and Being, as through this balance emerges the flame of creative comprehension. Transcendental music, paintings, sculptures are all of vital importance, as it is shown by the magnificent Stone of the Sun, a clear example of manifested art. Regent God: It is related to happiness and dance, to the art of singing. 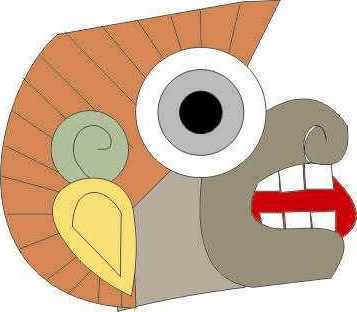 This eleventh sign of Ozomatli is represented with either a head or the whole figure of the monkey. It is generally depicted with utmost clarity. The Borgia and Bolonia codices show the monkey dressed in malinalli herbs, and in most of its depictions, the monkey sports white, oval earrings with pointed ends. These are also shown as a pendant carried by the Gods of Dance. Frequently the monkey appears showing its tongue. It regent is Xochipilli (the Lord of Dance, Love and Flowers) and carries an epcololli, a fragment of conch hanging from its ears. The Location of the Day in the Borgia Codex: It is found on his hair, symbolizing intelligence and beauty.